What Does the Filter System Look Like? 1. Where is the water filter system located? 2. Are all water filter systems universal? 3. Can you run a hot tub without a filter system in place? 4. Can the filter cartridge be changed separately from the filter system? Are you looking at buying a new hot tub? Have you already bought one but don’t know how to set it up? Are you moving and unsure of how to relocate your hot tub? If so, it might be time for a new hot tub filter system. Replacing your old hot tub filter system isn’t as hard as you might think it is, and neither is putting in a brand new filter system for a new purchase, but it will take a little bit of extra knowledge in order to get it done right. In this article, you’ll be provided with plenty of information to help you from start to finish. You’ll learn how to recognize the various working parts of your filter system, and how to install each one. You’ll also be provided with answers to some of the most common questions about Jacuzzi water filter installation. The second half of the article is devoted to teaching you how to install a Jacuzzi filter, no matter what type of hot tub you might have. By the time you’ve finished reading through the list of tools, skills, and steps you’ll need to complete the project, you’ll be ready to head to your backyard and get started working right away. All you have to do first is read up on the method. Get ready to learn how to put in a new Jacuzzi without ever having to call a plumber. Please remember that this guide is only meant to inform you about the process by which you can change your hot tub’s filtration system. It is not intended as a substitute for any plumbing experience. It should also not be considered as a substitute for apprenticeships, vocational classes, or other education that could better instruct you on the proper method to install a hot tub filter system. If you find it difficult to complete this project on your own, consider calling a certified plumber or a hot tub repair technician to take care of the job for you. You will need a few tools in order to complete the water filter installation process. You will also need a few items that don’t exactly fall into the category of tools but will also be listed in this section. Depending on the type of hot tub you have, you might need a few different items than the ones listed here. Although this list is a good place to get started collecting everything you need, it’s always a good idea to look at your hot tub or thumb through your instruction manual before you get to work, just to be sure you have everything you need. Where applicable, variations on the types of tools listed will be noted. This is the most important tool you can have handy when it comes to working on your hot tub filter system. In some instances, this may even be the only tool you need to complete the job. Depending on the type of filter system you have and the way in which the housing unit is attached to your hot tub, you might need one of a few different types of screwdrivers to complete the job. Phillips head – This is the type of screwdriver used for screws that have an X-shape on the head. This is one of the most common types of handheld screwdrivers. Flathead – This is the other most common type of handheld screwdriver. It is made for screws with a single straight line on the head. Power screwdriver – In some cases, a power screwdriver will be required to take care of very difficult screws. If your filter system seems too hard to remove by hand, you’ll need power tools to complete the task. Some types of filters and housing units are installed on the side of the hot tub using a wrench, nuts, and bolts. In other instances, you might need a wrench in order to turn or tighten valves that are attached to your pipes and lines. There are a couple of different types of wrench you might need to have handy, depending on your hot tub. Allen wrench – These are hook-shaped pieces that come in a variety of sizes and can help you remove nuts and bolts. They fit into the center of the bolt and help loosen it when turned against the direction in which it was installed. Standard wrench – This is an important part of any repair job and can be used to loosen bolts from the outside of the piece. You might not need these, depending on the type of unit you’ll be installing. However, they’re always handy to have around when you need to hold valves and pipelines in place. Replacement filter housing. You can’t replace your filter housing without a new housing unit. Have this handy before you get started so you won’t have to walk away to set it up. Replacement filter system. In most instances, this and the filter housing unit are packaged together and won’t appear as separate pieces. This is not always the case. Replacement valves and lines. If you have damaged valves or lines to your filter, you’ll need your new pieces before you get started. Replacement cover. The cover to your filter system should come with the whole setup, but just in case it doesn’t, have a new replacement handy. Replacement cartridge media. After you install your new system, you’ll need to put in a fresh filter cartridge. Once you have your tools gathered and you know a little bit more about what you’ll be doing, it’s time to determine whether or not you feel like you have the skills required to take on this project. Overall, this isn’t the type of DIY repair that requires a lot of specialized knowledge, but you will need to know how to do a few things around your house in order to complete it. Take a look at the list of skills below and weigh them against your own abilities. If you feel uneasy about any step in the process, it might be a good idea to call a technician or a plumber instead to take care of the repair for you. The ability to turn off the power to part of your home. If you don’t know how to flip the breaker that operates your hot tub, you should learn this before you go any further. It’s unsafe to perform this task without turning off the power first. The ability to turn off the water to your hot tub. You’ll need to shut off the water completely so as not to damage the pump while you work on the hot tub. The ability to use hand tools such as a wrench and screwdriver. Most of the installation process requires the use of some hand tools, and some pieces may need to be unscrewed completely by hand. The ability to use power tools such as an electric screwdriver. Not every hot tub will require this skill, but it’s a good idea to know something about operating power tools if you’ll be performing DIY repairs at all around your home. The ability to lift heavy parts. While most of the parts you’ll be working with for this project aren’t terribly heavy, you might need to be able to pick up your spa control unit, your filter system, or your pump, depending on how extensive your repair is. Now that you understand how to recognize the parts of your hot tub water filter system, how to troubleshoot common questions you might have about the system, and the tools and skills you will need to work on this important part of your hot tub, it’s time to get started on the installation process. Remember to work slowly and pay close attention to these instructions. Remember, too, that not every hot tub has the same features, and this is just a general guide to help you get started. If you have any further questions, refer to your hot tub’s instruction manual or call the manufacturer. Your hot tub filtration system is probably partially installed if you are just setting up a new hot tub. If your hot tub has been in place for a while, however, you might need to completely remove the filter system before you can install a new one. These directions work under the assumption that you need to remove an existing filter system before you can put in a new one. If you are simply setting up a new hot tub filter, skip ahead to the reinstallation part of the guide. 1. Turn off the power to your hot tub. This is an important first step before you perform any maintenance on your hot tub. You run the risk of potential electrocution when you start dealing with the inner workings of anything that is hooked up to the electricity. Shut off the breaker to which your hot tub is attached. 2. Drain your hot tub completely. While you may be able to perform some small tasks in and around your hot tub without draining it, for the most part, it is always important to remove all the water from the hot tub before you get started. This way, no parts will become potentially damaged from the presence of too much water. However, some hot tubs require a small amount of water to remain in the foot bath portion of the tub. If this is true of your hot tub, you can find this specification in your owner’s manual, or sometimes on a sticker on the side of your hot tub. 3 Turn off the water supply to the hot tub. Although the pump should not be running now that the power has been disconnected to the hot tub, it’s important to be sure the water doesn’t keep flowing through the pipes too. Turn off the valve that connects your hot tub with your home’s water supply before you go any further. 4. Disconnect any valves that connect your filter system to your hot tub’s pump. To do this, locate the pump portion of your hot tub. You will see a few lines coming from it. Find the valve or valves that connect the pump to the filter system and remove them from the filter system. Do not remove them from the pump side, as this is unnecessary and will only make more work for you later on. 5. Remove the spa button control unit if necessary. In some hot tub models, you won’t need to take off the spa button control unit in order to fully reach the filter system. In others, you will. You should be able to tell by looking whether or not you can reach the entire filter system without doing this, and your instruction manual will also let you know. If you do need to remove it, you should be able to do so easily either by hand or with the use of simple tools. 6. Locate the screws connecting your filter housing unit to the inside of the hot tub. These should be easy to spot. You will probably need to stand inside the hot tub in order to find them, however. Be sure to look near the place where you usually change your filter media, as this is usually the part of the hot tub where the housing unit is installed. In some models, this may be in the back of the hot tub. Check your owner’s manual for more details if you’re having trouble finding your filter housing unit. 7. Remove the screws and carefully remove the housing unit. You will probably need tools to remove these screws. In many models, a simple Phillips or flathead screwdriver can do the trick. In some, however, you might need power tools or an Allen wrench or standard wrench to remove the screws. You should be able to tell by looking which type of tool you’ll need to take care of this step. 8. Discard the housing unit and any damaged lines. Some hot tub parts are partially recyclable, while others are not. Dispose of the damaged housing unit and any other pieces you will be replacing, such as the filter flap or cartridge. 9. Line up the new filter cartridge housing unit with the screw holes in your hot tub. Since you should always purchase pieces for your hot tub that are made by the same manufacturer, you shouldn’t have any trouble being able to align the new piece with the one you just removed. They should be the same type of filter housing, and the new one should simply slide into place. 10. Reattach the new housing unit. You can do this by simply reversing the method by which you removed the old unit. Reattach the screws using the same type of tool you needed to remove them. Attach the unit firmly, but be careful not to screw it in so tightly that you’ll be unable to remove the screws after the hot tub has seen a lot of use. Screws that are attached too tightly might also rust more easily than those that can allow for more space, and they might also strip over time. 11. Attach the cover to the filter unit if it is not already attached. Most filter housing units come packaged with the cover already attached, but some don’t. In just about every case, this part should snap easily into place when the unit is installed properly. Be sure to attach it in the right direction so water can flow freely through the housing unit and into the filter chamber. 12. Insert your filter media as needed. This should be the same process by which you always install new filter media into your housing unit. It should be as easy as a few turns by hand. If your old media wasn’t very damaged or dirty, you should be able to use it in your new filter system. However, if the old media is nearing its time to be replaced anyway, go ahead and put in a new cartridge so you won’t forget to change it when the time comes. 13. Set the spa control unit back in place and reattach it with the existing screws. Do not tighten with tools. The tighter you make these screws now, the harder it will be to remove them later on when you need to perform more maintenance on your hot tub. Secure them tightly enough to be sure the unit cannot fall off, but be careful about how tight you make them. If you did not need to remove the spa control unit to reach the filter system in your hot tub model, you can skip this step. 14. Replace any covers to the spa control unit or filter housing unit. In some models, you might not have had to remove these covers at all. If you did, you might want to think about giving them a quick rinse with the garden hose or scrubbing them down with a wet towel before drying them and replacing them. This will make your next cleaning day a little bit easier. 15. Reattach the valves connecting the filter to the pump. This is one of the most important steps of this process, as it will ensure that your hot tub can start running smoothly again. If you have purchased a replacement part that is exactly the same as the one you removed, which you should have done, it will be very easy to reattach the valves. Simply screw them back into place in the same locations from which you removed them on the old unit. 16. Close the bottom drain valve caps on the filter housing unit. This will keep water from entering parts of the hot tub where it could potentially cause a problem. These caps are a part of the valves that are attached to your filter unit and pump. Now that the valves are back in place, you should be able to see how the caps fit onto them. This can usually be completed by hand without the use of extra tools. 17. Perform a once-over check to be sure everything is back in the places where it all belongs. Make certain everything is attached well and doesn’t seem rickety or like it might fall off. Be sure the filter cover and cartridge are both in place and ready for use. Check to be certain you removed all tools, parts and packaging from the inside of the hot tub. If necessary, wipe out the inside of the hot tub to keep it clean before adding water back to the tub. 18. Turn the power back on to your hot tub. This step should be as easy as flipping the breaker switch back on. Give the hot tub a few moments to have power again, and you’ll be ready to be back in action. 19. Turn the water back on to your hot tub and fill the hot tub to just above the minimum fill line. This may take a while, but be sure to follow the directions outlined in your hot tub’s instruction manual to refill the tub properly. You should always refill the tub through the filter system in order to remove any unwanted debris and minerals from the water supply before it reaches the hot tub. 20. Run the hot tub through at least one cycle to be certain that the filter is working properly. This step is crucial before you jump in and start using your hot tub. For one thing, it takes filters one or two cycles to start working to the best of their ability and to remove all the debris and minerals from the water in your hot tub. For another, this gives you a chance to be sure you hooked everything back up properly and that it’s working the way it should. 21. Your hot tub is now ready for use. Congratulations! You’ve just replaced your hot tub’s filter system on your own. Now that you’ve been through the process once, it should be easy for you to repeat it in the future. Before you can work on replacing your hot tub filter system, it’s a good idea to familiarize yourself with all the different inner workings of the entire system. Remember, however, that if you’ll be replacing the entire system, you’ll usually purchase it as one whole unit rather than buying separate replacement pieces. If you’re installing a new hot tub that hasn’t had its filter set up yet, the same will be true. Rarely will you need to concern yourself with replacing individual pieces, but it’s always a good idea to know what you’re working with. Most hot tub filter systems are very similar, but they aren’t all the same. Yours may look somewhat different from the standard, especially if you have a specialty hot tub or filter. With that said, you can probably find between fifteen and twenty individual pieces that are fairly universal between all hot tub filter units. 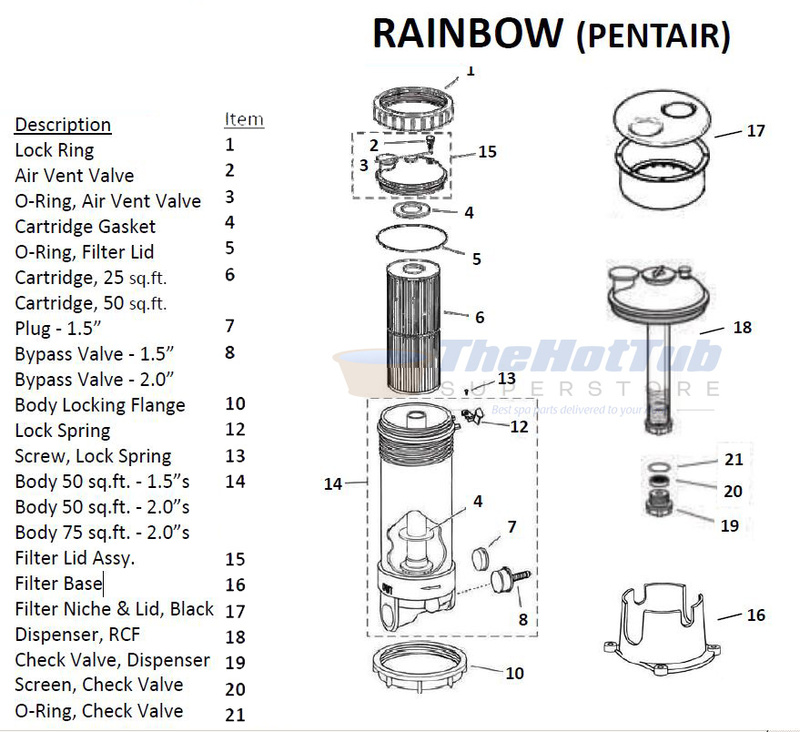 The top portion of the filter unit is comprised of the lock ring, the vent valve, the cartridge gasket, and a couple of o-rings that help connect everything. The middle of the filter system is made of the filter cartridge, the bypass valve, and a few screws and plugs that help keep everything in place. The rest of the unit is made of the filter body and base, as well as a check valve and water dispenser that allow water to flow freely throughout the filter. The makeup of the entire unit may differ from system to system, but these items are usually all stacked together in a canister shape. This is then attached to the hot tub as part of the filter housing unit. The housing unit contains the majority of the filter system and is attached to the valves that connect the filter to the pump. The housing unit should have its own separate lid that allows water to pass through it and into the filter. Now that you know a little bit more about what you’re looking at in your water filter system, it’s time to dig a little deeper into the potential questions you might have about working through this replacement process. Remember, again, that every hot tub is different and might not follow these exact specifications, but this is a good starting point to help you figure out how yours is set up and how you can perform this DIY repair project on your own. On most hot tubs, the water filter system is located inside the filter housing unit, which is inside the hot tub itself. However, in some models, this may be located on the outside of the hot tub instead, separate from the filter housing unit. It’s best to look at your instruction manual if you’re having a hard time spotting the water filter system on your model. Not exactly. You won’t be able to install a specific type of water filter system in any hot tub, but many of them are close to the same size and include many of the same parts. This means that if you’ve ever installed one before, you should have a pretty good idea of what you’re doing, even if you’re installing a different one this time. You can, but it’s not recommended. Filter systems help keep unwanted debris and harmful bacteria from entering your hot tub water. Running your hot tub without the filter system in place can also cause serious damage to your pipelines and to the pump, which can be much more expensive to fix than replacing the filter. Yes. You don’t have to replace the filter cartridge at the same time you replace the whole system, and you don’t have to replace the whole system every time you change the filter cartridge. These are two separate parts of the entire filter unit. It might seem like a big job to replace your hot tub’s filter system or to install one into a new hot tub, but remember that it’s really just a series of a few steps you have to perform and then reverse to complete the project. There are a lot of great reasons why you might want to take care of this job on your own, and the sooner you give it a try, the sooner you’ll be able to see just how easy and beneficial it can be for you to install your own filter system. Of course, one of the biggest reasons why you might want to take on this DIY project on your own is to save money. It can cost quite a lot of money to call out a plumber or hot tub technician to take care of replacing a problem piece, and you’ll end up paying for someone else’s labor as well as for the part or parts you need to fix the unit. If you’re able to do this on your own, you’ll be able to cut the cost down significantly by only having to purchase the replacement pieces to get the job done. It can also save you a lot of time and hassle to replace broken filter units on your own. It can always be difficult trying to balance your life with a plumber’s busy schedule, and often, the plumber isn’t keen to show up on time. When you’re planning to fix your unit yourself, you don’t have to worry about fitting into someone else’s time frame. You can take care of it on your own whenever you have a chance. The next time something goes amiss with your hot tub’s filter unit, you’ll know what to do. Pick up your tools, grab your replacement piece, and don’t be afraid to get out there and fix it yourself!